Have you been thinking you want to go solar? Bristol Electronics is the place to call. Over a year ago we met with another company and were so frustrated by the whole process that we decided to forget all about solar power. But when we met Bristol Electronics staff at the Bristol Harvest Festival, they encouraged us to rethink it. We’re glad we did. Everyone at Bristol Electronics is friendly, courteous, professional and efficient. They are patient with questions and concerns and they go beyond what they have to do. The price was fair, the installation was completed on schedule, and even the cables and wiring were neatly done! The design met our power needs, gave us the latest, most powerful panels available, and the panels are barely visible high up on our rooftops but they are up there working away – – – LOVE watching the meter go backwards! 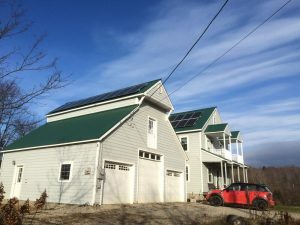 We wanted to invest in our property, instead of the stock market; and even though it was early winter when the installation was complete, we began to see a reduction in our power bill right away. We are looking forward to this summer and having zero electric bills!